A few polls came out the day of my last post concerning the 2016 election. So taking those into account, I now think Arizona, Florida, North Carolina, Ohio, and Nevada are too close to call. In Nevada’s case it’s due to a lack of polling on the state level. In my last post I considered North Carolina barely in Clinton’s margin and an important state for the Trump campaign but I now consider it too close to call. 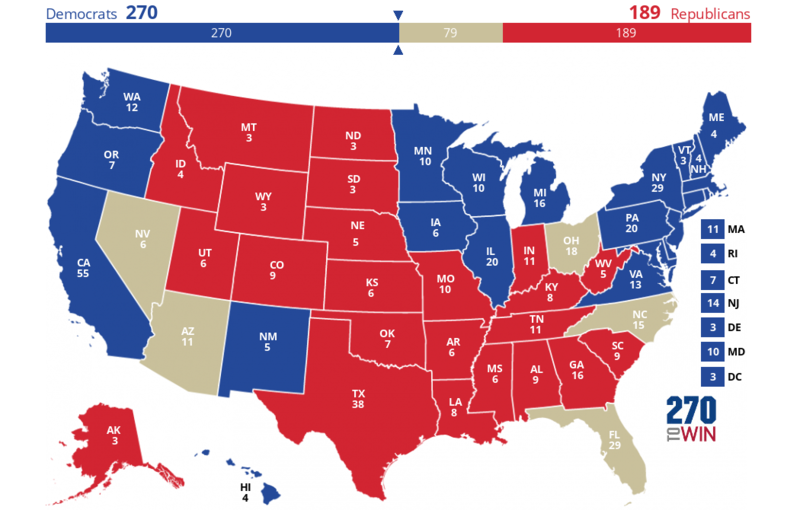 Taking that all into account I think Clinton will get at least 270 electoral votes, Trump at least 189 and 79 electoral votes are up for grabs. With Clinton still reaching 270 at a minimum, this would still place her in the White House. Trump would need to put another state in contention where Clinton still has a lead and gain that in addition to the five other states in contention to win. That is a long shot for his campaign. Now for the potential spoilers, both Governor Gary Johnson (L) and Jill Stein (G) will be on the ballot in most states in 2016. The Libertarian Party is on track to be on the ballot in all 50 states while the Green Party will be on many of them but missed crucial deadlines for states like Arizona. In polls where Governor Gary Johnson and Jill Stein were included, the polling gap between Clinton and Trump narrowed. Johnson has been polling as high as 12% while Jill Stein has been polling at around 3-5%. This really only comes into play if Jill Stein can spoil a state for Clinton or Johnson gains enough momentum to take a state from Clinton like New Mexico, where he was a successful Governor. If that happened the election could potentially go to Congress where things would become very interesting. We will have a better picture of how things may work out after the respective conventions are completed. It ain’t over until three fat ladies sing – one at each political convention, and the final one at the general election.